UK screw clamp connection system Screw connection-tried and quality copper alloys tested throughout the world - elimination of screw back The screw connection system is know and out using the Reakdyn principle accepted worldwide as the most frequently used type of wire termination. Due to the highest contact forces, top reliability is attained regardless of the conductor cross section. The UK universal terminal block series has the following features. Screw cage components made of high. ST spring cage connection system Spring cage connection-space-saving design. 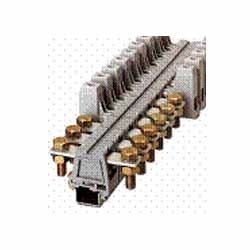 Range are as follows:- The spring cage connection system secures -flexible plug-in bridging the conductor by pressing the wire against the system current bar. - large surface center marking The contact force is fixed and cannot be influenced by - generous wire entrance to the wiring technician. handle wiring with or without An outstanding feature of the Patented spring from a ferrule. Phoenix Contact is its space-saving design. The special features of the ST product QuiZ IDC connection system Fast connection- Time savings of up to 60% Properties as a result of using a high quality copper alloy. The QuiZ QT series provides the fastest connection for terminating a wire. Solid or stranded conductors can be wired with the fast connection system from Phoenix Contact. There is no need to strip wires or crime ferrules. The V shaped contact slices through the conductor insulation and displaces it, providing a vibration resistant and gas-tight connection for the wire. Mascot Systems is the leader in offering various industrial protections solutions. We are an authorised dealers of world famous brand name like Phoenix Contact Interface, Phoenix Clipline, Tecsis Force Transducers, Tecsis Pressure Measurement, Tecsis Temperature Measurement, Phoenix Automation, Phoenix Trabtech, Phoenix Combicon and Phoenix Pluscon, etc. We believes in providing very best products and solutions to every customers - regardless of the size of the customer or the size of the order. The company has established a status of a supplier of quality products from the beginning. We always focus on high quality and to achieve total customer satisfaction. With wide product range, Mascot Systems keeps strengthening its customers base to include some of the most well recognized manufacturers in the industry Mascot Systems offers customized engineering support services and best sales assistance. We are experienced in to industrial protection solutions seeking profitable growth by Selling and supporting a wide range of 'best-in-class' products and solutions > Providing superior technical and application support for products and solutions. Educating our customers on new innovative technologies that will reduce their costs, improve their > performance and increase their competitiveness.